PORT MORESBY (Radio New Zealand International/ PNG Post-Courier/ Pacific Media Watch): The Pacific Forum leaders summit has concluded without unity on climate change. While leaders have talked of solidarity, cracks have appeared over the subject of climate change. Representatives from the 16 forum member countries gathered in Port Moresby over the week to address issues concerning the region, but there are a several conflicting positions, particularly when it comes to Australia and New Zealand. Small island states have called for a global moratorium on new coal mines, which may struggle to get the backing of the wider forum, and enough of a reduction in emissions so that global temperature increases do not exceed 1.5°C over pre-industrial levels. More developed countries like Australia and New Zealand have targeted 2°C in the past. Calls for the region's metropolitan powers to adopt more significant measures to tackle climate change have taken on added urgency in a year where the islands have experienced climate chaos on a number of fronts. The devastation of Vanuatu by Cyclone Pam in March was the most pointed example of the risks associated with increased cyclone severity in the region. Flooding caused by huge spring tides in parts of Micronesia in late summer was blamed by local officials on climate change - as were unseasonal storms still affecting parts of the region. And now, several countries in the Pacific are struggling with the worst drought in decades as this year's El Niño weather pattern takes full grip. In Papua New Guinea's Highlands alone, dozens of deaths in recent weeks have been linked to food shortages caused by the prolonged drought and severe frosts. And, just to underline the climate disorder in the Pacific, freak hailstorms killed 11 people in Indonesia's tropical Papua province in July. New Zealand's Prime Minister John Key said he was comfortable with his country's stance and position on climate change. Both New Zealand and Australia have made no commitments to reduce emissions further so that global temperatures didn't increase more than 1.5 degrees above pre-industrial levels. They are sticking with the United Nations promoted limit of two degrees. Kiribati President Anote Tong has begrudgingly accepted that not all the Pacific Island Forum nations will agree on climate change, but he said there needed to be a uniform position to take to the global UN climate change COP21 meeting in Paris later this year. "It's not the best outcome that we would have liked but I think we must respect that whether we accept that or not is a different question but at this point and time we would like to be able to sit down as colleagues and agree on the range of numbers rather than one or the other and I think this is the way we have come out of this meeting," he said. His counterpart from Palau, Tommy Remengesau, echoed his sentiments, saying the time for talk had ended and that urgent action was needed - which would require greater unity. "This is the challenge facing regionalism - what can we do that brings out the most good for everybody, especially when it comes to matters of life and death and survival, sustainability? 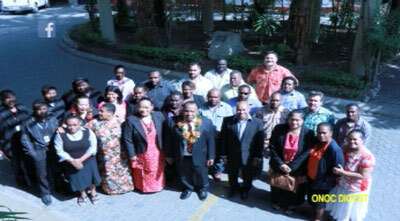 "Those issues are the very reason why there is a Pacific Islands Forum. If you don't believe in those then there really should be no solid effort here," he said. Samoa Prime Minister Tuilaepa Sailele Malielegaoi conceded there was frustration among Pacific nations. "All the Pacific islands are always frustrated because you are not talking about small changes," he said. "You are talking about survivability - because, if climate change is not stopped, and the obvious occurs, like a rise in sea level, a lot of the countries in the Pacific would just disappear." Niue Premier Toke Talagi said, while there were differences in the various countries' positions, they were understandable. "Every country has the right to express their view about climate change. We must accept and respect the fact that each country will have their own differing circumstances in relation to economies and so on," he said. "This is the same as Niue so therefore I don't have any problem with New Zealand and Australia being different." 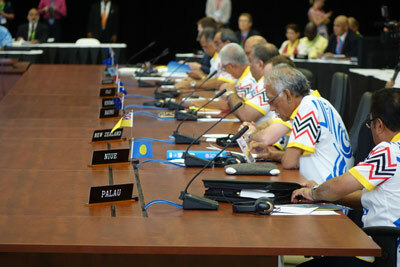 Samoa's Tuilaepa said, despite differences, he did not expect animosity to develop between the various nations. "We talk like brothers and that's why we call our exchange retreat because you can swear at each other and no one knows." 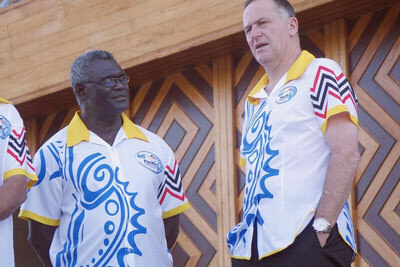 New Zealand Prime Minister John Key suggested Pacific nations needed to put more pressure on even bigger nations like China as his country was only responsible for 0.15% of the world's emissons. His Australian Prime Minister Tony Abbott agreed. "Australia and New Zealand have already announced very ambitious targets for emissions reduction to take to the Paris conference," said Abbott. "New Zealand's got a 30 percent target. Australia's got a 26 to 28 percent target for emissions reductions and that compares to 25 percent for Japan, 4 percent for Korea. China is going to have a 150 percent increase in its emissions between now and 2030." One thing Tong was happy with was a move towards the New Zealand-led quota system in regional fisheries. The summit had been told by Feleti Teo, the head of the Western and Central Pacific Fisheries Commission, that the bigeye tuna catch had been unsustainable for some time and taking action could not be delayed any longer. With the threat to fish stocks clearly laid out, John Key said a change in approach was a must. "The resources earnt by the countries in the region is based off selling access to your fisheries on a daily basis. That's fine except technology is changing, boats are larger. They are becoming more proficient and so a greater catch is occurring and if that continues then there is real risk of sustainability of particularly the tuna fishery." Fisheries ministers from all forum nations have now been invited to New Zealand to examine the management system in place. Furthermore, New Zealand is to provide US$30 million over the next three years to help the region change the way it manages declining fish stocks. Australia also announced it would invest US$13 million into maritime surveillance within the region to help police the fisheries. Regarding the other big agenda issue, human rights abuses in the Indonesian region of Papua, or West Papua, Pacific Island leaders urged the Forum Chair and PNG Prime Minister Peter O'Neill to approach Jakarta about their concerns and discuss their openness towards a fact-finding mission. "On West Papua we note that we respect the sovereignty of Indonesia over West Papua, and we note some of the concerns that we have about the human rights concerns situations in the Papuan provinces. "And that is why we are calling on all parties to protect and uphold the human rights of all residents in Papua and leaders have requested the Forum Chair to convey the views of the forum to the Indonesian Government and to consult it in on the possibility of a fact finding mission to discuss the situation in West Papua for all parties concerned"
He also announced that the Indonesian government was to be commended for the efforts it has made so far in making sure that there is more autonomy given to the West Papuans. Meanwhile the Pacific Freedom Forum (PFF) criticised the recent detention of Pacific journalists covering the Forum. PFF said it was yet another "diplomatic insult" to the Fourth Estate and needed urgent attention. "Members of the Pacific Islands Forum are notorious for hosting events that detain, sideline and obstruct news media from doing their jobs," said PFF chair Titi Gabi. 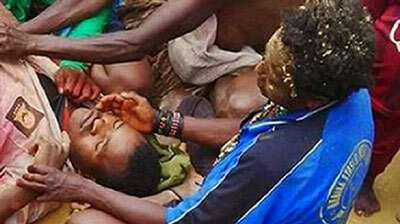 "This latest incident here in PNG sends an especially bad signal when the region is demanding open access to West Papua." West Papua campaigner Benny Wenda was refused a visa and not allowed entry, despite earlier promises from Prime Minister O'Neill. "This is a direct denial of freedom of access, movement, and speech on an issue that is the region's most urgent human rights concern," said Gabi. 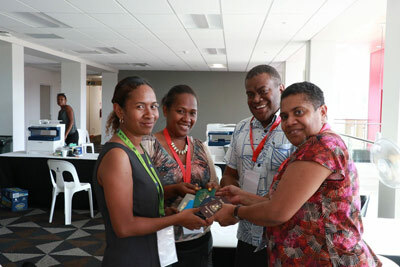 Pacific journalists arriving in Port Moresby for Forum were detained by immigration authorities, had their passports taken, and were forced to pay $1000 kina (US$360) visa fees before entry. Gabi said the one good thing that came out of the latest incident was the quick action taken by the PNG Foreign Affairs minister. "We commend his decision to stage an inquiry into this incident and call on him to raise this issue with his regional counterparts," PFF said. Among those detained was senior Islands Business editor Samisoni Pareti, who posted news of his detention on Facebook. "Their treatment compares with colleagues from New Zealand and Australia who, as members of official parties to PNG, enjoy visa-free entry," says Gabi. Treatment of the journalists in PNG raised deeper concerns for those coming from countries under the Melanesian Spearhead Group, which claims to allow visa free travel between members. PFF Co-Chair Monica Miller said that Pacific journalists have also long raised the point that Australia and New Zealand also charge steep fees, for even transit visas. "Oceania states cannot hope to benefit from regionalism if they keep denying media access to borders and sources," she said. "Oceania governments need to encourage Pacific news media to take greater interest in regional affairs, not punish them," said Miller. "Journalism is not a crime." PFF repeated an earlier call for Pacific governments to host a meeting with regional media to address these and other issues, following up on the successful 1990 convention in Rarotonga, Cook Islands.